Emily Casey knows she should be happy her sister Nancy is coming home from the mental hospital. Everyone tells her that Nancy is completely cured. She is over the murderous rage that made her try to kill Emily last year. But what if they’re wrong? Emily wants to forgive and forget, but soon after Nancy arrives back home, the nightmare has started all over again. Someone wants to hurt Emily. Is it Nancy? Or is there someone else who wants Emily dead? It has been a long time since I have handed out a ‘5 out of 5’ (ten books to be exact) but there was little to think about with “The Stepsister 2”. I loved this book, and while it did not have the things I usually look for in a perfect five – there was never really a question. But perhaps I am biased? Nah. R.L. 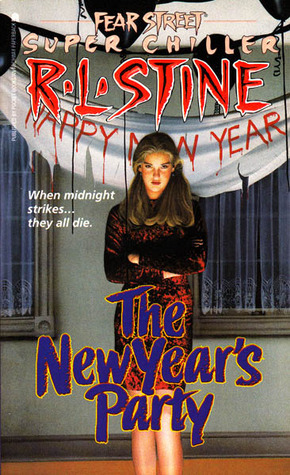 Stine only continued six Fear Street book storylines past its original inception, which means that the sequels must come from something pretty special. But this is the first sequel that really made as big of a splash as the original. In fact, nearly every sequel that I have covered so far, takes away from the original – they aren’t even neutral. Quick recap (spoilers alert! ): In the book “The Stepsister” someone is trying to kill Emily Casey. The book (and killer) set up Emily’s new stepsister to take the fall because she has a dark past. She found the body of her best friend and many people thought she had killed her. She didn’t, by the way. Emily is pushed down some stairs, her dog is murdered and many other things happen to let her know someone is out to get her. And that someone ends up being her sister, who blames Emily for their father’s death (just because she witnessed it, but who said crazy had to make sense). Fast forward one year: Nancy is back! Emily is both excited and terrified and maybe this is one of the reasons I liked this book (and the original) so much. Emily. Emily is one of Stine’s better characters. She is sweet and the kind of person you could easily be friends with, but she is human and flawed – never pretending to be pedestal-worthy. I doubt she knows what one is! So anyway, as soon as Nancy returns the nightmare begins all over again. And I mean in the déjà vu sort of way. A trip down the stairs, a dress cut in half super glue as toothpaste and a horrific car accident (her brake line was cut) is only the beginning. The prime suspect is of course Nancy, but Stine throws a few other suspects in the mix to make you doubt whether you really think it is Nancy or not (Emily’s stepbrother Rick for instance). I also liked this book because it took Jessie’s (Emily’s stepsister and Nancy’s original patsy) storyline with her friend and expanded on that. In a way, Jessie has someone gunning for her too. And it is up to the reader to decide if Jessie’s pursuer is harmless or harmful. Is Emily even the intended target of everything (she shares a car with Jessie, Jessie borrowed the dress that was cut up, etc.) or has the person really been after Jessie all along? P.J. wasn’t supposed to die; it was just a practical joke – it was supposed to be funny. But P.J. had a bad heart… Reenie and her friends tried to tell the police what they had done, but then the body disappeared… Now someone is killing them, one by one. Someone is taking P.J.’s revenge, but who? By midnight they’ll know, because when the clock chimes, they’ll all get a kiss. The kiss of death! All right, so I know that the summary of the book may seem kind of hokey, but this is one of the better Super Chillers I have read so far. The book begins in the year 1965 and is something of a ghost story. You feel for Elizabeth and Jeremy, who you meet in 1965, and the story behind this book really starts there, with them. Then jump thirty years into the future (present day – this was published in 1995) and the reader meets Reenie and her friends: Greta, Sean, Ty, and Artie, a group of friends who are constantly trying to scare each other by faking their own deaths. I don’t really understand the appeal, but this group seems to think it is a riot, until they meet the two new kids at school, P.J. and Liz. Reenie becomes fast friends with Liz and Greta is interested in P.J. even if she already has a boyfriend (Artie). In all fairness, Artie and Greta always fight and Greta keeps thinking about breaking up with him. I don’t blame her. If I was seeing someone like Artie, I would also be looking elsewhere. Anyway… the book alternates between 1965 and the present day (1995) for most of the book. The reader wonders what happened to Beth and Jeremy from long ago, and even once we have some answers we are still left with even more questions. P.J.’s body disappeared before the police arrived and he is missing. But now someone is killing the people involved in P.J.’s prank, one by one. And I don’t mean just the people who were directly involved… let’s just say the killer is believer when it comes to guilt by association. As the book winds down the reader wonders which of Reenie’s friends will survive the end of the book. Will any of them survive? Do you like secrets? Holly does. She is Shadyside High’s biggest gossip and she always has the juiciest news. But this time she’s heard a really terrible secret, and now her friends know it too. But someone didn’t want Holly to know; someone wants to make sure that she and her friends never talk about it again. Someone who will go to any length to keep them quiet. Lying… Threats… Even murder. The way this list of Fear Street books were ending up, I wondered if I would have a post of three perfect fives… so close! I don’t think this book would have ever been a perfect five, but something that certainly didn’t help was the big secret Holly heard. I was expecting something incredibly, “Oh my God!” and while the secret was juicy… criminal even… I have read much more horrific things in other books in this series. But once a murder takes place, things get going and this book takes off, and gets much better than I thought it could about a third of the way in. I feel like I should clarify something right off the bat. Holly isn’t what I would call a gossip. She doesn’t spread rumors and gossip maliciously. She is like Harriet the Spy – nosy and curious, but good-natured and sweet. She is the bubbly girl who is eager to help someone out and is aware of other people’s feelings. When she has a juicy secret, she only tells her two best friends, Miriam and Ruth. (Note: This book is actually told from Miriam’s perspective, not Holly’s.) And they don’t tell a soul, but because Holly is curious to a fault she does ask questions and she isn’t above eavesdropping. It is her eavesdropping that begins this whole mess. When a murder takes place in the book things really get interesting. There are books where you have no idea who the killer is. There are books where you have tons of suspects just because they had the opportunity, but motive and everything else is a complete mystery. There are books when you completely lack suspects and books where you have a good suspect and are blindsided when the killer turns out to be somebody else. This book wasn’t any of those kinds of books. This book presented five excellent suspects, with four different motives. There were the obvious suspects: two individuals who would be most hurt by what Holly heard (I kind of loved using the title there). There was the mysterious suspect: a potential red herring whose precise motive was cloaked in mystery, but the opportunity was there, and this individual was acting strange and violent as of late. There was the procedural suspect (you know the husband and wife are always the first suspects, etc.) and then there was my gut suspect. There was not a clear reason or any real clues that this person had the means, opportunity or motive, but I seriously thought he/she was the killer and couldn’t shake that hunch. What amazed me beyond having such a large suspect pool, strong suspects with diverse motives, when the murder (and book itself) did not take place in a claustrophobic space (like being trapped on a boat with strangers, for example), was that the person who was murdered was so damn likeable. I mean this is someone who did not have enemies (or at least didn’t have many) and yet what a list of suspects! This entry was posted in Book Reviews, Books, fiction, Guilty Pleasures, Reviews and tagged "super chiller", crazy, ghosts, gossip, love, mental institution, murder, New Year's, real killer, revenge, rumors, sequel, sisters, supernatural. Bookmark the permalink.